It’s been almost a year since a true Milan legend left us. Cesare Maldini is probably best known amongst our generation as the father of Paolo, and grandfather of Christian and Daniel. But in addition to having the good footballing genes to pass on to his posterity, he had wisdom. Wisdom that came from experience. Few realize that before Paolo was our captain, Cesare was also a legendary Milan captain in his own right. Cesare was born in Trieste, near the Slovenian border, and it is widely reported that one or both of his parents were Slovenian. He played as a defender and spent his youth career playing for local side Triestina. At 20 years old, he was promoted to the first team, where he played for two years, including some time under the legendary Nereo Rocco. In 1954, he transferred to AC Milan. He played as a center back in front of Lorenzo Buffon, uncle to modern day Gigi. Cesare easily made it into the starting eleven in his debut season. Also on that team were players like the legendary Nils Liedholm and Gunnar Nordahl. Together, they won the Scudetto in Cesare’s first season. He would play twelve seasons total with Milan, winning four Scudetti in all. In fact, he became captain in 1961, and was captain when Milan was the first Italian team to lift the European Cup in 1963. This was while he was once again managed by fellow Trieste native, Nereo Rocco. By the time he left, Cesare had made a massive 412 appearances for Milan. Looking from his posterity backwards, it is not a surprise that he was a skilled and elegant defender. He was considered very good in the air, and was one of the best defenders of his day. In fact he is still considered one of the best Italian defenders of all time. It also should not surprise anyone that he was only sent off once in his career, having received five yellow cards total. Cesare also had 14 caps for the Italian National Team throughout 1960-63. He was even named to the FIFA World Cup All-Star Team in 1962. In 1966-67, after he left Milan, he played once again for Nereo Rocco at Torino, a man he considered a mentor as well as coach. When he hung up his boots at the age of 35, his football career was only just beginning. He was an assistant coach to Nereo Rocco at Milan from 1970-72, then was head coach from 1972-74. He won both the European Cup Winners Cup and the Coppa Italia in 1973. After being sacked and replaced by Trappatoni, he ended up coaching Foggia for two years, Ternana for a year, and then Parma for two years. From there, in 1980, he was an assistant manager to the legendary Enzo Bearzot for the Italian National Team. This included the 1982 World Cup in Spain, which Italy won. Hardly finished, he coached the Italy U21 team from 1986-1996. 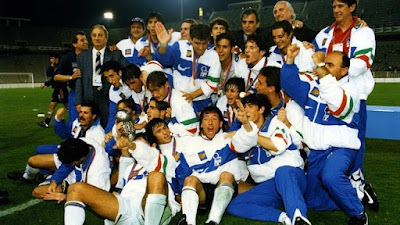 During this time, Italy won the Euro U21 tournament a record three consecutive times in 1992, 1994, 1996. He personally won the Panchina d’Oro (Golden Bench) award in 1996 for best Italian coach. Of that 1996 team, there were a few names one might recognize: Gianluigi Buffon, Fabio Cannavaro, Alessandro Nesta, and Francesco Totti, all of whom would go on to win the World Cup in 2006. His next step was the Italy Senior National team, in 1996. He was to replace the legendary Sacchi. Italy were undefeated through the playoffs of qualification for the World Cup. 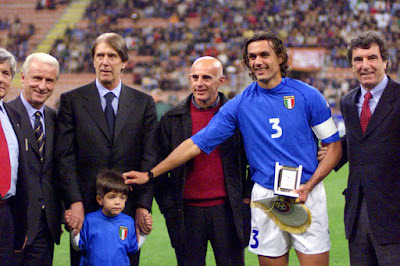 And in 1998, with his son Paolo as captain, he led them to the Quarterfinals of the World Cup where they lost on penalties to hosts France, those penalties considered a curse to Italy. He quit after the tournament amidst criticism. Cesare did some scouting for Milan after that, and had one last brief spell as an interim manager for Milan at the end of the 2001 season, where once again, his son was captain. His last stint as manager was to lead Paraguay to the 2002 World Cup, where they were eventually eliminated in the Round of 16. Many remember him later in life for his unrestrained sound bytes as a commentator for Al Jazeera and BeIN Sports, amongst others. He also was a talent scout for Milan once again after the 2002 World Cup. But he was also a devoted husband to Maria Luisa, who also left us a few short months after he did last year. They had a total of six children, but the one everyone knows about is Paolo. He is the link to the Maldini Dynasty. Paolo may have surpassed his father in Milan and Italy lore to modern generations. Him raising the Champions League trophy 50 years after his father lifted the European Cup Winners Cup for the same club is a legend in and of itself. And Paolo’s children, Christian and Daniel have the opportunity to extend that legacy. But if they do, they will always be in the shadow of a great man. A man who brought glory to both Milan and Italy through a long career on the pitch, on the bench, and in the booth. 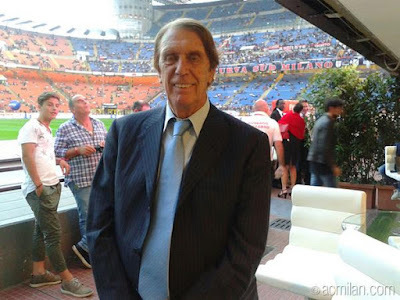 If anyone could ever be considered a patriarch to Milan, it was the late Cesare Maldini.